In our review of The Hangover Part III we focused on the law of diminishing returns; essentially the more you have of something, the less special it becomes. Some franchises can buck the trend and become bigger and stronger as they progress, some coast along pedalling out the same old stuff you’d expect and some totally try and reinvent themselves in later iterations of the franchise by putting “new” spins on the topic. So which tact does the current film take? Well… it’s about cars… going fast… and being driven furiously. Yeah, it doesn’t take a genius to figure out the route they’ve taken. Maybe that’s an unfair thing to levy on Fast & Furious 6, after all we HAVE seen changes… mainly to the titles of the damn movies. We had The Fast and The Furious, then 2 Fast 2 Furious (clever… I see what you did there), followed by The Fast and The Furious: Tokyo Drift, Fast & Furious, and finally Fast Five. Jesus, is it that hard to decide whether you want to use the definite article in your bloody titles!? Then do you want to stick with numbers? Seemingly reboot the number series on the fourth go? Drop most of the words on the fifth? It’s honestly enough to give you a headache… but there’ll be no such issues with the plotting. Yes, this is a movie about cars being driven around. I’m not going to kid you all here by pretending to be an avid fan of the series, as I watched the first two, then got bored, and returned to the series with Fast Five. I actually found 2011’s sequel quite entertaining, mainly due to the inclusion of Dwayne Johnson‘s lawman Hobbs. Thankfully he’s back here too, along with all of the regulars including Vin Diesel, Paul Walker, Ludacris, Michelle Rodriguez etc. etc. So what is the “plot” this time around? Well after the gang disbanded after Fast Five, they’re pulled back together to confront a new bad guy, evil British guy Shaw (Luke Evans) – yes, us Brits are evil… again! Why are they helping out Hobbs? Well, it seems like Shaw’s managed to recruit Michelle Rodriguez‘s Letty into his ranks… and she’s the love of Vin Diesel’s life. The plot is extremely thread-bare and banal. All you really want to see are long, elaborate car chase sequences, a truckload of action and some back-and-forth humour. I can tell you something… you get all of these. Most impressive was the dialogue; I actually found Fast & Furious 6 far funnier than The Hangover Part III. Far, far funnier. The writers are having fun and the snappy banter between all the protagonists is probably the highlight of the movie for me. I’d have been entirely happy to have neglected the cars entirely and just focused on the gang, but I guess that’d be against the ethos of a car film wouldn’t it? So, I had no issues with the dialogue, as I found it quite enjoyable. The acting? Well, again – no real problems here too; mainly because these films don’t require a lot of acting grit. I’m not expecting tears, I’m not expecting poignancy, nor am I expecting some truly touching moments to occur. I get none of those, so it’s just as well isn’t it?! But having said that, the fact that the movie doesn’t require sublime acting does not work in its favour, as it all just feels incredibly vapid. Maybe I’m just not the target demographic for this film – the type of person that giggles and applauds when “car go bang” (they were in my showing… I wish I was kidding). Working off this premise, maybe I just over-think the film too much too. Let’s take the final set piece of the film – the plane bit. Ok, now you’re thinking I’m ruining the film aren’t you? You’ve seen the trailer right? The one that spoils EVERYTHING for you? Well, if you have then… well, I guess the film’s spoiled for you. Anyway, the airplane scene… think about it. It goes on for a good 15-20 minutes to be the fitting climax to the “bang bang boom” movie. Now think how long this runway needs to be. A plane… that’s trying to take off… going along tarmac in a straight line for 15-20 minutes. That’s a hell of a long runway! See, it’s this train of thought that makes me think I’m definitely over-thinking Fast & Furious 6 way too much. Maybe I should have just focused on Dwayne Johnson‘s sizeable traps and just thought “damn… that dude works out”. Then applauded like a seal when he pulled off a pseudo-wrestling move. Fast & Furious 6 isn’t a thinking-man’s film. It’s big, dumb and gets the job done… it’s just a fun popcorn film. I didn’t approach the film expecting much, and it at least surpassed those expectations. I was genuinely impressed at the level of humour, but was just left feeling cold. 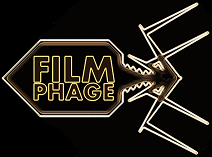 At Film Phage, we’re not huge fans of this franchise. So the “credits sneak peek” at Fast & Furious 7 didn’t make us tingle all over. It made us roll our eyes and wonder what the “plot” will be next time. Having said that… if they keep the humour levels up, we’ll be there again, as it’s bound to be funnier than anything Todd Phillips writes soon. 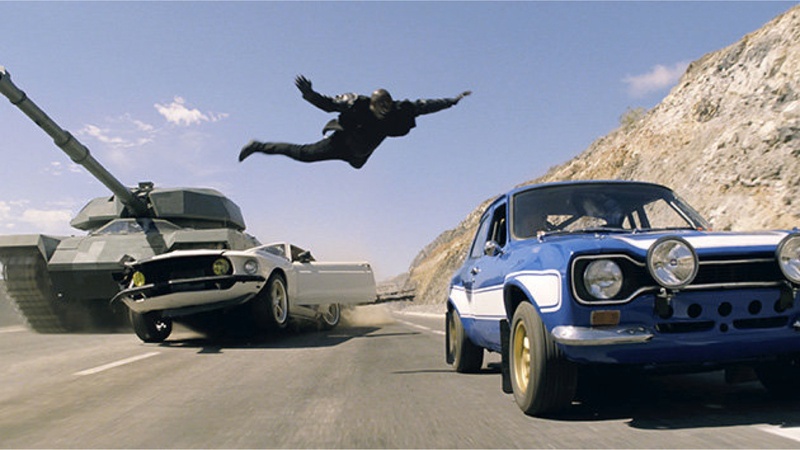 Also, we can’t help but wonder just how the hell they’re going to write Fast & Furious 7. Fast7Furious? Faster 7? Fas7? Who knows! Maybe we’re more excited about this than the film itself. I’m not sure if the law of diminishing returns works here for us, as it was already on a pretty low rung (for our interests anyway) when the franchise set out. The crowds keep turning up and the films keep selling. At least they’re (almost) teaching their audience how to count… and drop definite articles. This entry was posted in Review and tagged airplane, cars, Dwayne Johnson, Fast & Furious 6, Fast & Furious 7, Fast 6, Fast Six, Jason Statham, Ludacris, Michelle Rodriguez, Paul Walker, runway, sequel, The Rock, Vin Diesel. Bookmark the permalink. Good review. It’s as dumb as you are going to get this summer, but when it’s as fun and crazy as this; you can’t ever go wrong. It does exactly what you hoped it’d do… still, I wouldn’t mind a little more of “something”! Just saw this yesterday and even though I’m almost 40 I still was grinning like a teenager and was full of adrenaline afterwards….I loved it. Funny you mention the runway thing….I was saying the same thing yesterday! Ha – see, great minds think alike. I wish I could see this 10 mile long runway… it must be out there somewhere! Hahaha, it should be…I think the calculations I saw made it about 30 miles! I would have no chance with this. I have been caught muttering “this defies the laws of physics” during far more sensible films. I am a massive over thinker. I can’t abide a plot hole. I hope you’ve watched How It Should Have Ended’s take on Iron Man 3 then? http://youtu.be/OUYW0JyzydA – a good laugh at Iron Man 3 and The Dark Knight Rises’ plot holes!